Moose Creek Lodge - Fightingtown Creek, Great Fishing, Secluded! Perfect For Large Families! 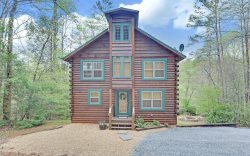 While staying in a Blue Ridge cabin rental in or around the area, discover the many fun and exciting things to do in Blue Ridge GA from outdoor adventures to local brewpubs there is truly something for everyone. The Appalachian Trail starts at the top of Springer Mountain, which is in Fannin County. The Benton McKaye Trail is the largest spur of the Appalachian Trail and it goes thru Fannin County. In fact, there is more than 300 miles of hiking trails in Fannin County. How’s that for attitude? Also, we have 3 waterfall hiking trails. But within a 39-minute radius, there are 9 waterfalls, including the Amicalola Falls State Park. Amicalola Falls are the tallest falls east of the Mississippi River, falling from the top down to the river 729 feet below. There are a couple of hiking trails to see the falls, one is about half way up and is relatively flat for about ¼ mile in each direction. For the more adventurous person, there is a small hike of a little over 400 steps from the middle of the falls to the top. Here's more information on Amicalola Falls. Also, Fall Branch Falls are one of the most popular because of the ease of the hike and the beauty of the falls. Benton MacKaye Trail and Duncan Ridge Trail are locally favorite trails. The Toccoa River is a great spot also for tubing and relaxing. Once the Toccoa River crosses the Tennessee state line it changes names and becomes the Ocoee River. Heard of it? Well, it was the river where all of the whitewater events were held in the 1996 Olympics. The Ocoee River is home to some serious white water rafting. Rapids on this waterway range from class I to class V rapids. There are many choices when rafting, so read some reviews and also make note of which section you would like to ride on, as they are all three different in difficulty. Other outdoor adventures include tubing. Tubing on the Toccoa River is a great time and only takes a few hours. There are several outfitters to choose from. Toccoa Valley Campground rents tubes, as well as Toccoa River Adventures. There are basically two sections of the Toccoa River that is able to be tubed. The upper and the lower. The upper Toccoa River is in the southern part of Fannin County, and the lower is in the northern part. This is because the river flows from south to north, and because the river has Lake Blue Ridge Dam in the middle of the north and south. The next adventurous thing to do is to get in touch with nature would be a zipline or canopy tour. There are two of these companies right here in Blue Ridge. There is Blue Ridge Canopy Adventures and Zipline Canopy Tours of Blue Ridge. Either place gives a lengthy tree top ride that will be unforgettable. Another outdoor adventure and perhaps the newest is Super Truck rides. These trucks are made out of Hummers or old military trucks. They have five point harnesses and travel through rivers, creeks, across mountains, and over four wheel drive trails. After all of this there are two more excellent outdoor fun times. One is the Blue Ridge Helicopter tours where you can take your choice at how long of a tour you would like to take. You can fly over downtown Blue Ridge, Lake Blue Ridge and the Cohutta Mountains. Last but certainly not least…..DRIVE A TANK AND CRUSH A CAR! Yes we have true military tank driving adventures. You can learn to drive a tank, and for the grand finale you can crush a car with your tank! There are only two places in the country you can do this and one of them is right here in Blue Ridge, GA. Yes, that’s attitude. Experience all the exciting things to do in Blue Ridge GA on your next mountain vacation rental! Book your vacation rental today.